Energy Saver Mode When the device server is not used for a certain period of time, the power supply to the USB bus is turned off to save energy. The power supply to the USB bus is automatically turned back on when the server is used again. The Printer AutoConnect feature works with the Windows or Macintosh printing system and allows multiple computers to easily share USB printer over the network by making an automatic connection to the printer. Then it will automatically disconnect after the print job is sent making the device server available to the next user. Isochronous Transfer Mode USB devices such as Webcams or USB sound cards, which require ongoing data transmission in real time, can also be used in the network environment. 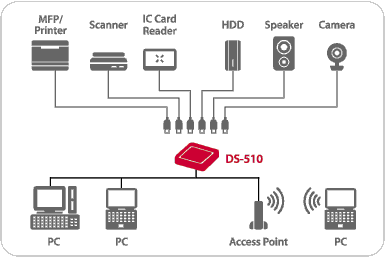 Best Compatibility with a variety of USB devices over the network, like USB dongles, disk drives, flash drives and other storage media, scanners, printers, digital cameras, USB sound adapters, USB displays, input devices, mixing consoles and many more. Virtual environments: The USB Device Server is compatible with virtualization programs and environments such as VMware, Citrix, Microsoft Terminal Server and Hyper-V.
No special drivers or applications are needed to use the USB devices: Drivers and applications that worked when the USB device is directly connected to the computer will continue to work across the network connected to the DS-510. 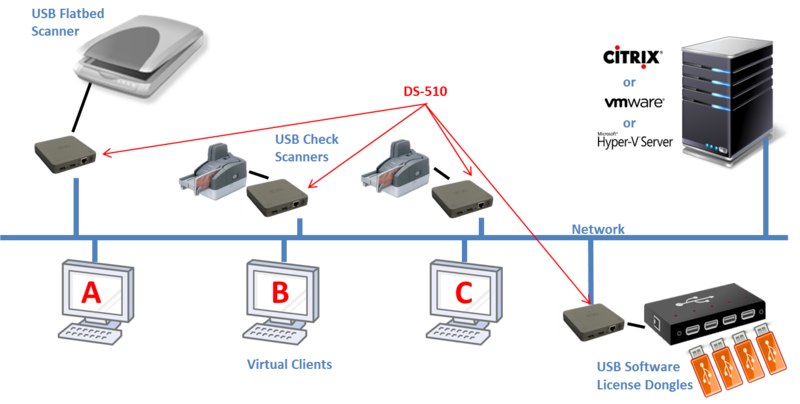 The included Silex SX-Virtual Link software precisely emulates a USB connection on a Windows or Macintosh computer, and then redirects the packets over the network to the USB port of the DS-510.